Pinworms are common contaminants of laboratory animal facilities. Pinworm infections can have adverse effects on behavior, growth, intestinal physiology, and immunology of experimental rodents, making effective pinworm surveillance and eradication important for many facilities. However, eradication of such infections is complicated by the ova’s ability to aerosolize and remain viable in the environment for lengthy periods. Pinworm eggs are microscopic and have been found on equipment, shelving, in dust, and in ventilation air intake ducts. The University of Tennessee at Knoxville performed a study on chlorine dioxide gas’ effect on pinworm eggs to see if it was a viable option for treating contaminated spaces. Prior to this study, only ethylene oxide gas and dry heat had been proven to eliminate pinworm eggs. 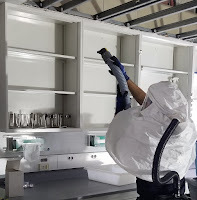 Ethylene oxide is not used for space fumigation due to its carcinogenic and explosive properties, and it is very difficult to uniformly establish and maintain the high temperatures needed for dry heat (212° F held for 30 minutes) to be effective. In a controlled study, Syphacia spp. ova were affixed to a slide and exposed to a set concentration of chlorine dioxide gas for varying amounts of time. After being exposed to chlorine dioxide gas, the ova were placed in petri dishes, covered with a hatching medium, and incubated at 37° C for six hours. Positive control ova not exposed to chlorine dioxide gas were also processed and incubated. To learn more about gaseous chlorine dioxide's effectiveness against pinworm eggs, visit Booth #1903 at this month's AALAS National Meeting or read the complete Journal of the American Association for Laboratory Animal Science article here.